The Bahía Santa María, also referred to as the Santa Maria Bay, is one of the top destinations for snorkeling in Cabo San Lucas Mexico. The bay is full of various tropical fish and marine life. The bay is shaped like a horseshoe and is perfect for families wishing to swim and snorkel in a beautiful marine sanctuary. The Santa Maria Bay is a favored destination for various charter boats that offer scuba diving and snorkeling opportunities from the Cabo San Lucas harbor. The enclosed nature of the cove protects it from the rougher waters of the Sea of Cortez. These placid conditions keep the water in the cove crystal-clear and allows for superior visibility, maximizing your snorkeling experience. You won’t miss any of the fabulous coral gardens or chromatic undersea life because of cloudy or turbulent water. The best time of day to experience the Santa Maria Bay is in the morning, when the water is calm and the fish are most visible. After your activies are finished, you can enjoy a nice relaxing walk on the beach and experience the spectacular view. The bay is considered an official marine preserve and you are permitted to feed the fish while you are there. If you want, the fish will even eat the food straight from your hand. There are very few facilities at Santa Maria Bay so it is suggested that you bring your own food, water, and other supplies. The most crowded days of the week for this very popular destination are Sundays, so if you want to get some exclusive snorkeling in or relaxing time in the sun then aim towards visiting the cove sometime during the middle of the week. 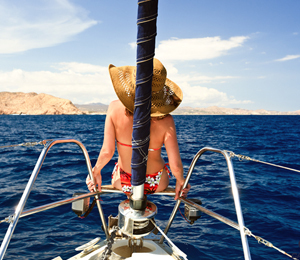 The Private Day Sailing with Cabo Sailing tour is one of the top activities for the Santa Maria Bay in Cabo San Lucas. The bay is a government-protected marine sanctuary with amazingly clear water due to the protected nature of the cove. 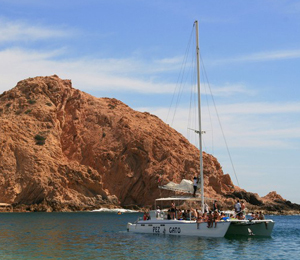 The forty-four-foot Ketch sailboat, the Yael, is the ideal method of sightseeing off the fantastic shores of Cabo. The half-hour journey aboard the Yael is the chance to unwind, taste appetizers, sip on a cold alcoholic beverage and enjoy the gorgeous panoramic view on the way to snorkel at Santa Maria Bay. Santa Maria's cove has a fabulous variety of coral formations and an amazing spectrum of tropical fish including Mexican parrot fish, box puffers, porcupine fish, brilliant clown fish, yellow snappers, and eagle and manta rays. You may even spot a reef shark, sea turtle, or octopus. During the winter months you may even view a Gray Whale in the Sea of Cortez. These gargantuan creatures migrate from northern waters to breed spawn and nurse there newborn calves. The Bahia Chileno Snorkel Adventure is also a great choice for anyone trying to experience the Santa Maria Bay, and serves as the final destination on this exhilarating snorkeling adventure. This one of a kind spot is perfect both for experienced and first-time snorkelers wishing to see an unforgettable view of the tropical marine wildlife in Cabo San Lucas.